The CJEU Grand Chamber, with judgment of 6 October 2015 (Delvigne case), ruled out that French law depriving some individuals convicted by means of a final judgment of their right to vote was incompatible with a number of principles of the EU Charter of Fundamental Rights (Articles 39 and 49). The judgment was already commented in this blog by Marco Borraccetti. The decision is important because it is the first time that the CJEU has issued judgment in this specific type of matter (for the CJEU’s case-law on the right to vote to the European Parliament’s elections see Borraccetti) whereas the ECtHR has ruled many times in similar cases in connection with the application of Article 3 of Protocol No. 1 to the Convention (right to free elections), in particular against the United Kingdom (e.g. GC, Hirst v. UK (No. 2) , 6 October 2005; Greens and M.T. v. UK, 23 November 2010; Firth and Others v. UK, 12 August 2014) and other ECHR Contracting States (e.g. Frodl v. Austria, 8 April 2010; GC, Scoppola v. Italy (No.3), 22 May 2012; Söyler v. Turkey, 17 September 2013; Murat Vural v. Turkey, 21 October 2014; and Anchugov and Gladkov v. Russia, 4 July 2013). The importance of the ECtHR’s case law has been defined as “the prisoner voting saga” (Milanovic). The relevance of the CJEU’s judgment was immediately highlighted in the English press (e.g., the Guardian), which called the decision an «unexpected ‘ruling’» which «has clear implications for Britain’s blanket ban on prisoner voting». The CJEU’s ruling arose out of a request for a preliminary ruling from the Tribunal d’instance de Bordeaux in the context of proceedings involving Mr. Delvigne on the one part and the Municipality of Lesparre-Médoc and the Prefect of Gironde on the other part. Delvigne was convicted in France of a serious crime and given a custodial sentence of 12 years by a final judgment delivered in 1988. By operation of law that conviction automatically entailed the loss of Mr Delvigne’s civic rights, including deprivation of his right to vote. A French law of 1992 then abolished the de jure loss of civic rights for persons whose conviction was final, providing that the total or partial deprivation of one’s civic rights had to be decided by a court and in any event could not exceed ten years (maximum sentence for conviction of a serious offence). However, the new law maintained the loss of civic rights (and hence the right to vote) for those whose conviction had become final before the entry into force of the more lenient rule, which covered Mr. Delvigne’s situation, affording those individuals the option of applying to the court to obtain the lifting of the said additional penalty. The questions put to the CJEU essentially concerned whether the French law applied to Delvigne was compatible with the EU Charter of Fundamental Rights, specifically Article 39 (right to vote and to stand as a candidate at elections to the European Parliament), with reference to the deprivation of his right to vote in European Parliament elections, and Article 49 (principles of legality and proportionality of criminal offences and penalties), with reference to the failure to comply with the provision to the effect that “if subsequent to the commission of a criminal offence, the law provides for a lighter penalty, that penalty shall be applicable”. The CJEU ruled out any violation of those principles enshrined in the EU Charter. As regards Article 39, the Court asserted that the deprivation of the right to vote is «provided for by law» and «respects the essence» of this right because it «does not call into question that right as such, since it has the effect of excluding certain persons, under specific conditions and on account of their conduct, from those entitled to vote in elections to the [EU] Parliament». The CJEU added that the said limitation does not conflict with the principle of proportionality since it «takes into account the nature and gravity of the criminal offence committed and the duration of the penalty» (paras. 47-49 of the Judgment). On that point, it is worth remembering that those conditions for lawfulness of domestic legislation limiting the right to vote of detainees had been laid down in ECtHR case-law. As regards Article 49, the Court fully endorsed the arguments of the French Government and only stated that the principle of the retroactive effect of a more lenient criminal law was not breached in the present case since the legislation in question «is limited to maintaining the deprivation of the right to vote resulting, by operation of law, from a criminal conviction only in respect of final convictions by judgment delivered at last instance under the old Criminal Code» (para. 56 of the Judgment). Finally, with reference to the issue of the proportionality of the French law in relation to the application of the EU Charter, the Court considered as decisive the fact that a person in Mr Delvigne’s situation could apply to the relevant court to lift the additional penalty of loss of civic rights. In our view the CJEU’s judgment suffers from a number of evident shortcomings in terms of both the method used to reach the decision in question and some substantive aspects. From a methodological standpoint, two criticism come to mind. The first concerns the total absence of any reference to the domestic legislation of the other EU Member States for the specific purpose of understanding whether, in light of the limitations on Mr. Delvigne right to vote, ‘the essence’ of that right and above all the principle of proportionality were respected. In this regard a comparison between the CJEU’s judgment and the ECtHR’s case-law is frankly embarrassing if one considers that the ECtHR conducted an in-depth survey of the domestic legislation of the Contracting States of the ECHR (legislation that is suitably classified by the ECtHR on the basis of whether it maintains or restricts in whole or in part the right to vote of detainees) and even analysed the relevant case-law from non-European States (Hirst (No. 2), paras. 33-39). This ECtHR approach is used to check that Contracting States have not adopted legislation that goes beyond their margin of appreciation (ever smaller under ECtHR case law). The second criticism regarding methodology consists of the apparently inexplicable fact (although in reality the explanation is simple and lies in a clumsy attempt to conceal a clear contrast with the ECtHR’s case-law) that the CJEU makes no reference at all to the abundant case-law of the ECtHR. This notwithstanding that the Preamble of the EU Charter reaffirms the rights as they result inter alia from the ECHR and the case-law of the Court of Justice of the European Communities [Union] and the ECtHR and that Article 52 (3) of the Charter states that «in so far as this Charter contains rights which correspond to rights guaranteed by the Convention for the Protection of Human Rights and Fundamental Freedoms, the meaning and scope of those rights shall be the same as those laid down by the said Convention». This choice is even more questionable because the conditions laid down by the CJEU to check the lawfulness of national measures that limit the right to vote of detainees are, as mentioned above, drawn precisely from ECtHR case-law. Turning now to substance, first and foremost one can criticise the assertion that there is no violation of the rights of detainees who are in the same particular position as Delvigne because they can always apply to a court to lift the ban and hence have their right to vote restored. With due respect to the CJEU, relying on a court’s discretion (even if bound by the provisions of law) is completely different from enjoying a right expressly provided for by law upon lapse of the additional penalty due the expiry of the period of time envisaged by the new domestic law on impediments to voting rights. The difference between the two situations is plain if one considers that the ECtHR, examining the laws of the Contracting States of the ECHR, stated that in France «prisoners may vote if the right is given by the court» (Hirst (No. 2), para 33, footnote 2). Moreover, in cases like Delvigne, judicial intervention is even not certain since it occurs at the request of the party concerned and thus it contradicts one of the conditions laid down by the ECtHR according to which «it is an essential element that the decision on disenfranchisement should be taken by a judge, taking into account the particular circumstances» of the case (Frodl, para. 34). Moreover, as regards the substance of the judgment, it is necessary to dwell on the application of the principle of proportionality, which in the present case plays a fundamental role. It is our view that in the circumstances the CJEU should have considered as disproportionate the national law that maintains a voting ban for those whose conviction had become final (before the entry into force of the new law). This is because the law is entirely unreasonable and discriminatory if one considers that for the same cases occurring after the entry into force the law provides for a more lenient additional penalty. Furthermore, one cannot rule out that the domestic law in question could even be held to be such as to jeopardise the very essence of the right to vote of detainees who find themselves in that same specific position since they are potentially deprived of their voting rights indefinitely. The CJEU’s judgement on the right to vote for prisoners as self-contained case-law? As mentioned the CJEU made no reference to either the domestic law of the EU Member States or the case-law of the ECtHR. It would therefore seem to be an expression in this subject of a self-contained regime or better still a self-contained case-law. In our view, the rationale for that (well thought out) choice made by the CJEU resides in a will to not openly reveal the evident contrast between the case-law of the ECtHR and the CJEU. It is in fact indisputable that the margin of appreciation afforded by the ECHR to the Contracting States has been gradually reduced as regards precluding the voting rights of detainees, in terms of both the application of pre-existing domestic law and the specific changes thereto (due to a need to comply with the ECHR), bearing in mind moreover that at times the preclusion of voting rights applies to individuals on conditional release and even to those who are given suspended sentences and therefore do not even serve a prison term (Söyler, para. 38). This is clear if one analyses the ECtHR’s case-law concerning the United Kingdom and the adoption, under Article 46 of the ECHR, of the pilot judgment procedure, with an express indication that, in the case of the UK «the only relevant remedy is a change in the law», setting a short timetable for the adoption of that legislation, i.e. six months after the date the Greens and M.T. judgment became final (paras. 118 and 115). In light of the above, we believe that a case similar to Delvigne (or indeed that same case should the applicant decide to pursue legal action and pass the admissibility test envisaged by the ECHR) would have a different outcome before the ECtHR. In this regard the central point (but not the only one) of the question lies in the failure to apply the more lenient penalty introduced by a subsequent law. This circumstance could be criticised by the ECtHR, in terms of disproportionality of the national measures, when establishing a breach of Article 3 of Protocol No. 1, and in terms of violating the principle contained in Article 7 of the ECHR (no punishment without law, which includes the application of the lex mitior to individuals convicted by means of a final judgment). Naturally, the ECtHR could well find that both provisions of the Convention have been breached. It therefore seems to us that the saga of detainees has not ended yet and, on the contrary, this new chapter could give rise to a further instance of contrasting case-law between the CJEU and the ECtHR. We remain seized on the matter! 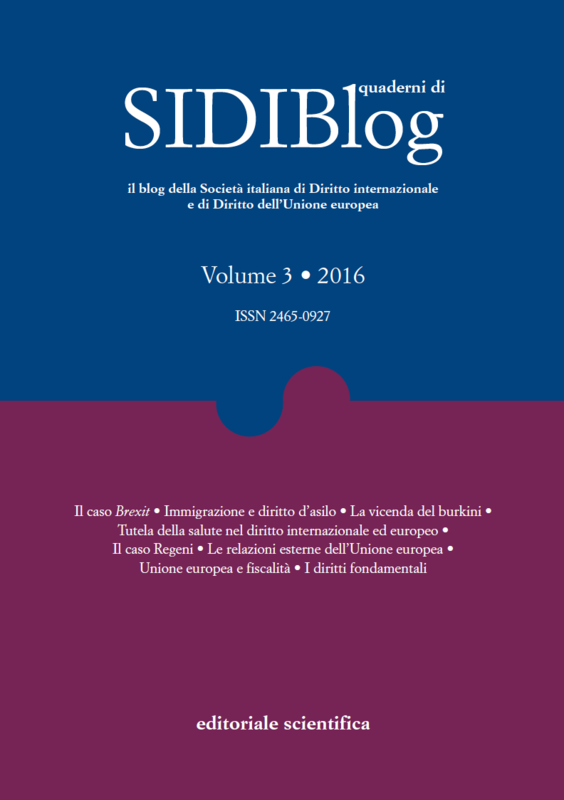 Verso una maggiore effettività del legal aid in Europa?